The Carl D. Perkins Career and Technical Education Act of 2006 (Perkins) calls upon states to create sequences of academic and Career Technical Education coursework to help students attain a postsecondary degree or industry-recognized certificate or credential, otherwise known as programs of study (POS). Offer the opportunity, where appropriate, for secondary students to acquire postsecondary credits. 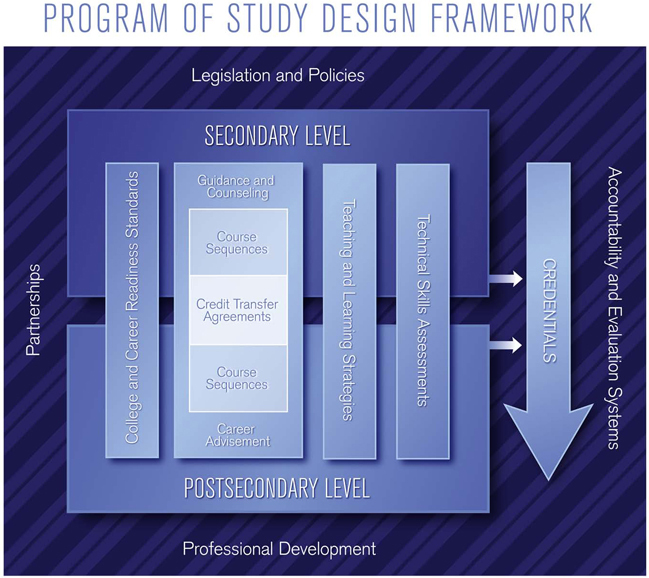 To help states and local recipients meet the new program of study requirements, the U.S. Department of Education's Office of Career Technical and Adult Education, in collaboration with major national associations, including Advance CTE, organizations, and states, have formulated a rigorous programs of study design framework. This framework identifies 10 components that, taken together, support the systemic development and implementation of effective programs of study. Although all 10 components are important, they are neither independent nor of equal priority. State and local program developers must identify the most pressing components for state or local adoption, taking into consideration their relative need within their educational context. The Career Pathways Effect: Linking Education and Economic Prosperity: Advance CTE and CORD partnered to develop this how-to guidebook for administrators, faculty, counselors, and business partners that provides insight from a broad range of national experts on CTE, Career Pathways and Programs of Study. NOTE: The Common Career Technical Core (CCTC) are a set of common, program-level standards for CTE designed to support POS development.